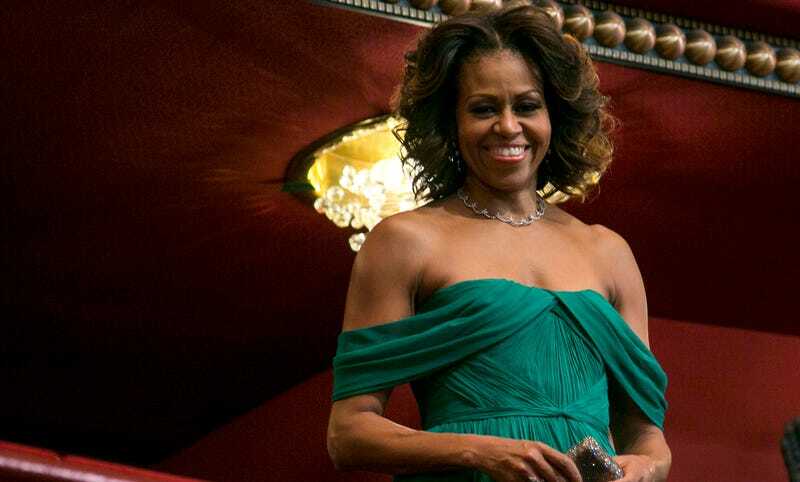 First lady Michelle Obama attends the 2013 Kennedy Center Honors on December 8, 2013 in Washington, DC. Melania Trump may claim to be the most bullied person in the world, but truly, has there been any first lady more scrutinized than Michelle Obama? During her time in the White House (and before—and since), Obama was attacked for her race, her hair, her body, and her mere existence as a black woman in a space many believed she had no right to occupy—despite her being one of the most educated and personable first ladies in history. And yet, not since Jacqueline Kennedy did a first lady so effectively capture the nation’s imagination and affection with her elegant, yet relatable style. In her new memoir, Becoming, Obama explains how, with the help of Chicago sales associate-turned-White House personal aide and stylist Meredith Koop, she turned a gendered preoccupation with her wardrobe into a strategic opportunity. Former first lady Michelle Obama speaks onstage at The 2017 ESPYS on July 12, 2017 in Los Angeles, California. Obama also sets the record straight on how she acquired her diverse and massive wardrobe, chosen from an array of selections Koop would bring to her every few weeks, and purchased by the first lady herself, save her formal gowns, which were donated to the National Archives as per White House ethics guidelines. Together, she and Koop would plan her wardrobe based upon her jam-packed itinerary. And unlike the current first lady, Obama attests that she wasn’t trying to send specific messages with her clothing. When it came to my choices, I tried to be somewhat unpredictable, to prevent anyone from ascribing any sort of message to what I wore. It was a thin line to walk. I was supposed to stand out without overshadowing others, to blend in but not fade away. As a black woman, too, I knew I’d be criticized if I was perceived as being showy and high-end, and I’d also be criticized if I was too casual. So I mixed it up. I’d match a Michael Kors skirt with a T-shirt from Gap. I wore something from Target one day and Diane von Furstenberg the next. I wanted to draw attention to and celebrate American designers, especially those who were less established, even if it sometimes frustrated the old guard ... For me, my choices were simply a way to use my curious relationship with the public gaze to boost a diverse set of up-and-comers. In fact, like Meghan Markle, another black woman who has recently risen to international prominence, Obama’s wardrobe choices were carefully curated to silently telegraph reverence and respect for both her role and everyone she encountered within it. And like most women of her stature, Obama’s impeccable looks were also due, in large part, to her glam squad, hairdresser Johnny Wright and makeup artist Carl Ray, both of whom were on hand for her recent cover shoot with Elle magazine, styled by Koop. In the cover story, Obama wears Dior, Sally Lapointe, Ann Demeulemeester and black woman-owned label Cushnie—and looks stunning. But as she reveals in Elle, she couldn’t do it without her team. Together, the three of them (dubbed by my larger team “the trifecta”) gave me the confidence I needed to step out in public each day, all of us knowing that a slipup would lead to a flurry of ridicule and nasty comments. I never expected to be someone who hired others to maintain my image, and at first the idea was discomfiting. But I quickly found out a truth that no one talks about: Today, virtually every woman in public life—politicians, celebrities, you name it—has some version of Meredith, Johnny, and Carl. It’s all but a requirement, a built-in fee for our societal double standard. Michelle Obama attends the BET Honors 2012 on January 14, 2012 in Washington, DC.